A paratriathlete motions to stand up after swimming in the waters of Copacabana Beach during a training session, in Rio de Janeiro, Brazil, Friday, July 31, 2015. The Brazilian government's data on water pollution in Rio de Janeiro show water near where triathletes are preparing to compete this weekend is "unfit" for swimming. Athletes have been dismissing the dangers of swimming in Rio de Janeiro's dirty waters, saying the risks are not great enough to alter their Olympic plans. 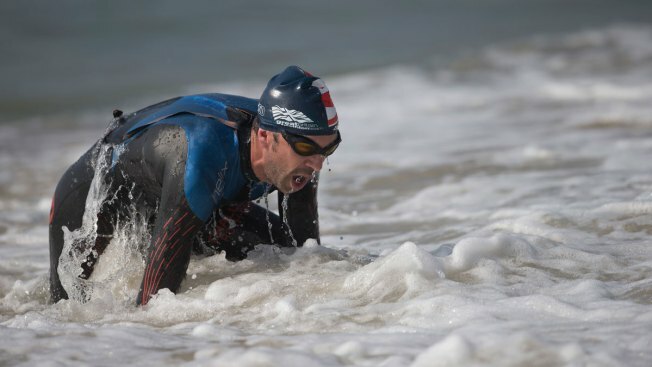 Despite a warning from a state environmental agency that some Olympic venues are unsafe, triathletes and paratriathletes entered the waters off Copacabana Beach Friday in an area considered "unfit" for swimming. They'll continue to compete this weekend in test events for next year's games. "We know we are exposed to viruses, maybe to health problems later," Costa Rican triathlete Leonardo Chacon said. "But in my case, I have invested so much to prepare myself for this and I want this to happen because I can't recuperate this investment any other way other than competing and winning the points that I need to win." For many, the reason is simple. There will be spots available for the 2016 Olympics in Sunday's triathlon test event in Rio. And the test events provide a unique opportunity to get to know the environment. "For me, the greater risk would be not knowing the course," said American paratriathlete Patricia Walsh, who was getting familiarized with the venue that will be used in paratriathlon's debut in the games next year. "For any athlete, getting in the water, any water, has its own amount of risk. If I didn't do that, I think it would be a greater risk than going in the water." The Rio de Janeiro environmental agency said the water was declared unfit based on the results of a Monday water test. The same spot, which is near where triathletes began swimming, has been declared unfit 10 previous times this year alone. Officials publicly insisted athletes were safe and stuck to the competition schedule. Later in the day, Rodrigo Garcia, the sports director for the local Olympic organizing committee, said that new, unpublished water test results show that the area is suitable for the competition, but provided no details on the results. On Thursday, The Associated Press released the results of a five-month investigation that showed that Olympic venues are rife with disease-causing viruses and bacteria. The AP study showed that the spot where athletes were entering the water on Copacabana Beach had a minimal reading of over 2 million human adenovirus per liter — that's 2,000 times the reading that water experts in the U.S. say would be considered highly alarming if seen on beaches in the U.S. or Europe. Human adenovirus multiply in the intestinal and respiratory tracts of people. These are viruses that are known to cause respiratory and digestive illnesses, including explosive diarrhea and vomiting, but can also lead to more serious heart, brain and other diseases. But most athletes say they are still being told the venues are safe by officials in individual sports, so there is no reason not to stick to the program. Officials with the International Triathlon Union may consider pushing for expanded testing of Rio's waters, said Shin Otsuka, executive board member out of ITU. Currently, tests evaluate bacteria, but not viruses. But the group is not suggesting athletes stay out of the water. Athletes said that the conditions of the water appeared better than they were expecting. But water experts and the government's own pollution monitoring officials all note that sewage pollution typically isn't something that can be seen by the naked eye. Although most athletes have been downplaying the dangers of swimming on Copacabana Beach, some teams have taken precautionary measures. Italian team doctor Stefano Righetti said athletes went through probiotic therapy to protect them against some of the diseases they could get by going into the water. According to American triathlete Tommy Zaferes, team doctors said athletes could take "extra precautions" by taking antibiotics if they wanted, but nobody on the team had taken the medication. "You can get sick anywhere, this is life," Zaferes said. "The water quality is bad in lots of places, it's not really a concern." Most athletes said they were being careful with any open wounds they might have, and were washing themselves thoroughly after leaving the water, but nothing out of the ordinary. Associated Press Writers Jenny Barchfield and Brad Brooks contributed to this report.